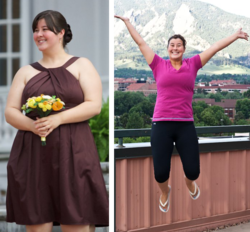 Blogging and using Calorie Count’s tools are the major factors in Gretchen weight loss journey. Being aware of the calories she’s taking in and then sharing them in her blog knowing that the whole world can read about it has allowed her to adjust her eating habits for the better. 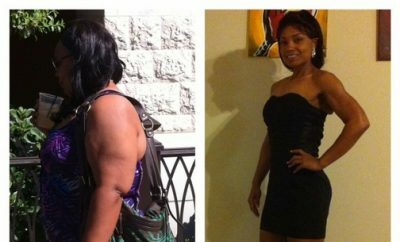 She has successfully lost 60 pounds! Most people will tell you that they saw a particularly unflattering photo, or someone said something to them, and it made them finally realize it was time to make a change. Despite both of those things happening to me many times over, nothing ever really sparked a “Eureka!” moment for me. Instead, it was more like a slow build, until I finally reached my tipping point. One morning I simply woke up and decided that I was going to be going on my final diet. It’s been over a year since then, and I’m still going strong! I think a more apt question would be what other diets HAVEN’T I tried! I considered myself a professional dieter! You name it, I’ve probably tried it: Atkins, South Beach, Slim Fast, the Cabbage Soup Diet… oy. The list just goes on. I haven’t ever paid to join a program like Weight Watchers or Jenny Craig (oh, to be young and poor! ), but I’ve tried to follow similar principles in past attempts. It sounds trite, but I honestly have done it the old-fashioned way. Counting calories, trying to be active, watching what I eat. In the beginning, I definitely had a strong reliance on pre-packaged foods and 100-calorie snack packs to get me through the day (and to make counting easier!) but over time I’ve transitioned to a diet based on the principles of whole foods and clean eating. I started a personal blog to hold myself accountable (by telling everyone I knew about it, haha) and still blog about the triumphs (and trials!) of my weight loss journey at http://honeyishrunkthegretchen.com every weekday. My difficulties have always surrounded my desire to lose weight conflicting with indulging myself. I firmly believe that life is for living, and that you should allow yourself occasional indulgences so you are less likely to give up (like I did many, many, many times before, haha.) But I know that all of my plateaus have arisen when I loosened the meaning of the word “occasional”. So I do still struggle with being able to balance the two sides of the journey. I started seeing results immediately. It sounds completely crazy, but my first weigh-in reported a TEN pound loss! I was ecstatic, but knew that I still had a long way to go before the results started becoming truly noticeable. After about 30 pounds, I started getting compliments and comments on my weight loss, so that’s how I knew it was, well, real. When you see yourself in the mirror every day, it’s sometimes easy to lose perspective on the fact that you are literally becoming a shadow of your former self! I know that my issues with binging and feeling emotionally tied to what I eat are things that I am probably going to have to struggle with for my entire life. That being said, I honestly feel that my entire lifestyle has changed thanks to this journey. Of course I still get cravings for french fries and tiramisu, but other things that I used to have no problem eating definitely do turn me off now (Slim Jims, ick!) My weight loss journey isn’t quite over yet, but I have confidence that this new approach is going to carry me into maintenance with ease. Oh my gosh, it is just so much better. I know that sounds cheesy, but it’s true. I was as depressed as I was obese before, and I took it out on my relationships and general satisfaction with life. Of course I still have bad days, but in general I am just, well, happy. I feel more confident and beautiful than I think I ever have, and I have developed such a passion for sharing my story and methods with others that are still living their “Before”. I have been hovering around the same weight for the past 3 months or so (plateau!) I keep saying that my weight loss journey isn’t over yet, since I would still like to lose another 20 pounds or so, but I know that this time I will make it to the finish line. Fat won’t make you fat! Incorporate portions of nuts, seeds, nut butters, fish, and avocado into your diet to help keep you full and satisfied. Make easy substitutions: plain nonfat greek yogurt tastes just like sour cream on a taco, scrap all your white pasta for whole wheat, and cottage cheese can replace ricotta in lasagna! Find exercise you enjoy: I’ve been forcing myself to keep running even though I, er, hate it. I need to remind myself to go back to what I enjoy doing – yoga, zumba, etc. so I don’t start to resent the activity! EAT BREAKFAST! I was a breakfast skipper in my pre-weight loss life, and getting myself in the habit of having SOMETHING first thing in the morning has really made a big difference. Taste the rainbow. No, I don’t mean eat Skittles, I mean that the more (naturally) colorful your plate, the better it is for you! Embrace meals that are comprised of multiple colors: red tomatoes, yellow bell peppers, oranges, purple eggplant, black beans, and green, uh, greens. You know the drill! 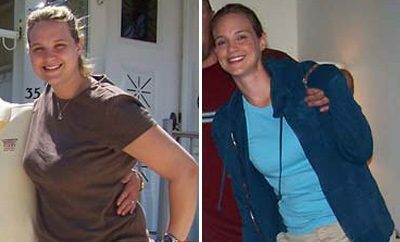 Next Story → Barbara Eckonen lost 45 lbs! Read on to learn how she did it!